The lake offers world class carp fishing; many competitions are held along its banks. Other species found in the lake are: Barbel, Tench, Pike, Black Bass, Mullet and Trout. You can see the fish jumping from the terrace! It is a perfect location for the beginner or for the more experienced coarse fisherman. Fishing is permitted all year round. It is just over a quarter of a kilometre to walk through the olive groves and on down to the lake or you can take the car down very close to the water. 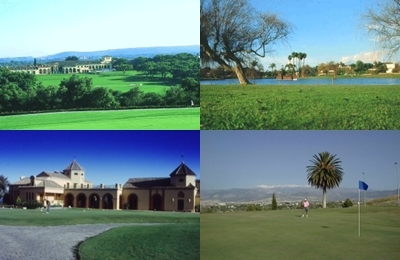 The world famous golf courses of the Costa del Sol are only an hour away and those of the Costa del Golf, including Valderrama, Sotogrande and San Roque, are about 1½ hours away. The nearest course to the house is the new course at Antequera. All 18 holes are challenging with plenty of water, narrow fairways, olive trees lining the first cut and subtle borrows on the greens. There are many interesting holes, a few spectacular ones and the views around the course are wonderful. There is also a members club at Granada (bottom right picture above), set under a fabulous backdrop of the snow covered Sierra Nevada, which allows visitors to play during the week. Both Antequera and Granada green fees are considerably lower than on the coast and the courses are better than most public courses on the Costa. Click here for a personal review of the courses within easy reach of Iznajar. 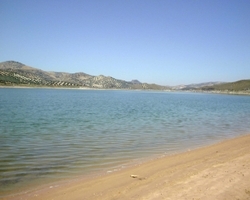 At Valdearenas beach there are facilities for a range of watersports. Swimming in the lake is wonderful, there is a sailing school right by the beach and you can rent pedalos and canoes. We have seen a windsurfer on the lake but, to date, have only experienced conditions there suitable for a novice rather than an experienced windsurfer. Apparently, you can also water-ski. 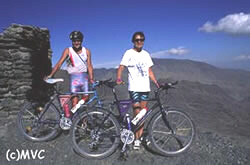 Mountain biking and cycling are viewed as both serious sports and a relaxing pastime in Andalucía. It is not unusual to be overtaken by a group of lycra-clad cyclists tackling the steep mountain roads, particularly at weekends. Not surprisingly, in a country with so many hills, mountain biking is a popular sport and better quality bikes can be rented in many mountain resorts. Bike hire, including helmet, gloves etc. is available within a few minutes drive of the house. The countryside in much of Andalucía is breathtaking and one of the best ways to appreciate the diversity and beauty of the natural scenery is on foot. 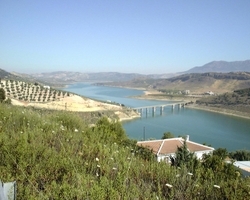 Iznajar is on the edge of the Parque Natural de las Sierras Subbéticas providing enormous scope for interesting walks. Click on this link: Parque Natural de las Sierras Subbéticas or on the map, for further information about the park, in English. Guided hikes (or, for the more energetic, guided trail runs) are offered by a local company. Those who find hiking not quite exciting enough may like to try mountaineering, rock climbing or caving, all of which are popular in this part of Spain with a wealth of challenges and some of the best areas in Europe outside the Alps. There are several mountaineering clubs and some challenging rock faces, particularly around the area of El Chorro. The ski resort of Sol y Nieve is located in the Sierra Nevada mountains. It is the most southerly ski resort in Europe and is small in comparison with other European resorts. It has numerous runs, of varying difficulties, to satisfy all skiing desires. Natural snow is supplemented by snow cannons on some runs. Being so far south, many skiers are pleasantly surprised to find the air temperature is usually warmer than other resorts. There is a surprisingly active nightlife in the Sierra Nevada resort. Spaniards have a reputation for being 'night owls' and this can be witnessed even in a skiing resort. Most of the visitors come from Madrid and the cities of Andalucia, weekends and banks holidays are particularly busy. The season is December to April. The resort hosted the 1996 world ski championships. The Sierra Nevada resort is only 45 minutes drive from Granada city, so about 1½ hours from the house.